You are here: Virgin Islands News Online » News » ESHS students searched for 'offensive objects'! When this news site appeared on the scene, teachers were on the sidewalk outside of the school advising arriving students of the search operation and collecting their cellphones for safekeeping. One teacher had a stack of smartphones in his hand. However, it appeared that he was holding on to the phones with a view to getting them back to the students at a later time as he had so indictated to one student. At the gate there were personnel from a security service who were checking students' bags and pockets. Even items such as afro combs were deemed offensive and taken away. At the gate, as part of the operations, were members of the Royal Virgin Islands Police Force. Speaking with this news site somewhat reluctantly was acting Principal Sandy M. Underhill who said the search operation was a random one which the school's administration was entitled to perform. Underhill was at the time supervising the search operations. She said that there was nothing to be alarmed about and noted that because they were busy there had not been a search like that for quite some time at the school. Over the past months there have been reports of violent incidents among students at the school. 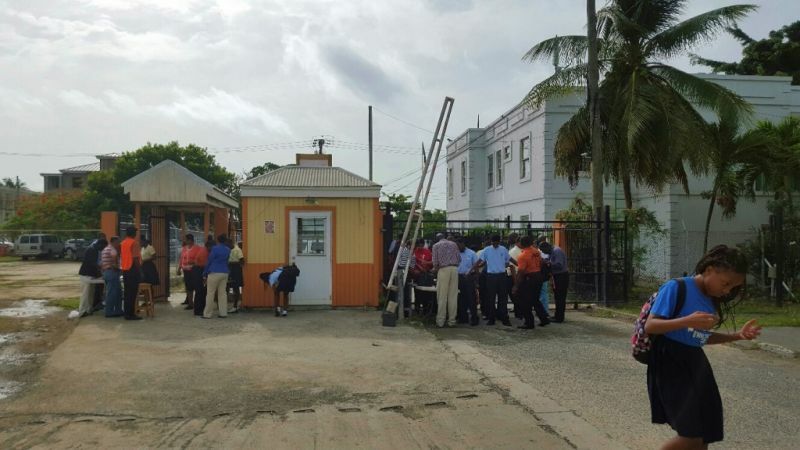 Just over a week ago the RVIPF reported that a 15-year-old male student received a stab wound to the face while on the Elmore Stoutt High School compound. Another male student was questioned in relation to the matter. Two days later, police said the victim and two other males were questioned in relation to a reported fight at Duff’s Bottom. A camouflaged brass knuckle was handed over to the Police. Charges were expected to be laid. Why they voilating the children rights? For the same reason your brain violates the right to having common sense everytime you post. They are not violating any rights. It is for they own good and protection. @joust asking...Look at the US, they take out God out of their school...children are given too many rights that is why school crime is on a rise and the innocent students are the ones who are going to get bullied and suffer. Them children need some old school discipline. It is time this happen. they need to put back up the metal detectors also. if some students would act like criminals then there is a need to do this to protect the majority and make school a safe place for them. In the states they have metal detectors as you enter and I think it should be a suggestion to ESHS, these kids are terrible and I think some of them are very disrespectful I feel sorry for the ones who are so nice and want to learn. I was in there some day's ago and the weed scent what hit me from a young man walking in the gate as I was leaving OMG. Keeping our children safe is extremely important so if that's what it takes to keep them safe I'm all for it. Look on the television we can see kids bringing weapons to school and taking innocent lives some of us don't think about that until it hits home. It was said that the million dollar wall will keep the children safe. This never happened under the previous ministers. Are you people for real? Search their bags yes! Why are coming to school with weapons and cell phones? Comb your hair at home, leave your phone at home and if you want to fight, then join Boxing or check yourself into Ballo. People, you are the reason why the children act the way that they do - like they are entitled. Utter nonsense comments from adults! @ Communism: we are faced with very serious issues in our territory and you can find time to be playing political games...how stupid can you be? Prisoners are allowed cellphones but not our students...WOW! As soon as Administrators try to implement something to keep the school a safe place for all involved the society is all over the administrators including the Ministry . Why can't parents ensure that students start at home by doing the right thing. Leave in their proper uniform and their books for the day and on time. Students leave their parents homes and vehicles with a copy book in their pockets and shirts flying. These are the handful of students who are rebellious to the authority of the school. So who to blame Myron and Underhill?. Parents need to take their responsibility seriously and stop having their children talk back to them like adults with no respect. Then they want to talk to teachers with no regard. Some parents instead of spending time to teach moral values to their house hold, they are busy ill speaking teachers . Children MUST behave as children where ever they are and who ever teaches them. The ministry is humiliating our kidz. Maybe they humiliating YOUR child/children. But I for sure feel safe knowing that my well behaved and disciplined child safer at school. Search them, search them ALL, even the teachers and the Principal if need be. We trying our best to protect them from the "enemy" outside the gates but think about this, what if the "enemy" is inside the gate? I drove past Great Wall of Tortola and saw a kid throwing over a backpack to I presume someone on other side. Anything could have been in the backpack. Guns, drugs or phones. There's no security that wall just bought votes it wasn't built to protect our children. MVW thinks everyone stupid as he is. Sound so stupid buh kids! Hate that word! A kid is a young goat! Maybe that is why they act so! I wonder if Saint Georges/Seventhday Adventist Secondary School have this problem with their students. I approve this action, the weapons, along with the mentality of today's children are atrocious in general. Nothing in my eyes is wrong with checking the children's bag for weapons etc. to ensure school safety. It should be a everyday thing if you were to ask me. I rather drop my child off knowing they won't have to be attacked with knives or matter of fact in these days with so many guns on the streets, guns... Check them ensure their safety. These schools now are being just the same as a public school in the ghettos. The children now are too rude and disrespectful. If you don’t want to be treated like a thief, thug, gang or troublesome child you need to help out by telling your friends badness out of style. Decrease the hate and uplift the love. What call weapons doing in a school for learning? When we fight back in the days we use our hands alone, now you see people getting killed for no reason. Do you think any parent want to see their child in jail must less killed? Wise up my youths and educate your mind not with guns and knives but with love and peace. You talk about senators and the government but it’s your family’s the same ones who’s in them same position. No 1 is perfect but if you kindly leave them few pointers in a letter or note, they might just understand. Instead you keep bashing them of things. Prisoners are not allowed cellphones so the person name " Well Sah" please go to police station and ask a question if you don't know. School is suppose to be a safe environmet, not a gand rest stop or village shop. They need to continue doind screening to teach them children a lesson. Crime pays. If parents don't have the knowledge of parenting how can they teach their children to obey administration when they as parent cannot get them to obey the rules of their own home. Children are getting away with to much and teachers are blamed too often for parents responsibility. Respect starts at home so don't blame the administration and the teachers blame your self. Some parent even want to blame the education minister for their children behavior don't blame him blame your self. Do what you have to do to discipline your children and stop putting blame on others. When you are going to college as an adult, you have to respect teachers so why the children can't do the same. So stop giving children precedence over theit teachers that's wrong. Teach the children in the way they should grow and when they become an adult they would not depart from it. PARENTD STOP WITH THAT BEAVIOUR.